Although sleeping on your stomach can reduce snoring and diminish sleep apnea, it can also be taxing for your back and neck. This is where the right pillow for stomach sleepers can come in. In this buyers guide, we go through what makes particular pillows a good choice for stomach sleepers, and review and recommend the best pillows for sleeping on your stomach. 2 What Makes A Great Pillow for Stomach Sleepers? This is probably one of the best pillow designs we have seen in a while. The Pancake Pillow, as hinted from its name, is an adjustable pillow that comes with 6 flatter pillows that slide into a cotton shell to create the actual pillow you sleep on. Made from the company GravitySleep Most adjustable pillows involve taking in and out actual fillings (shredded memory foam, microfiber, etc.) to change its thickness and comfort. 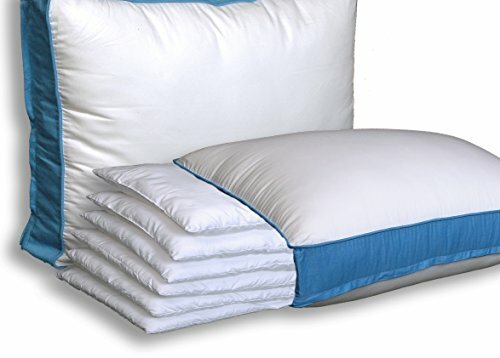 With this pillow, you can insert or remove smaller sized pillows within the pillow cover to do so. What you end up with is pretty much a more elegant and cleaner way of adjusting your pillow. The cover uses zippers, and adding or taking out layers is a simple matter of putting in or removing the pancake pillows. As a stomach sleeper, you might one to use 1 to 2, maybe 3 max of pancake pillows to sleep comfortably with support. Each pancake measures roughly 1 to 1.5 inches in thickness, which is rather thick in itself. When we first got our hands on the Pancake Pillow, it was a whopping 10 inches thick fully expanded. It did get us thinking that this pillow could be a great addition to daybeds, but that’s a story for another time. For the extra pancakes you might have laying around, you might want to consider getting an extra pillow case found here. We also really like the 3 inch gusset side support that provides some consistent thickness to support your neck. Pillows without gusset tends to feel like your head can roll off the pillow from underneath since the filling makes the pillow round. Each pillow is filled with microfiber, which is hypoallergenic, which is great in case you have allergies from goose/duck down or from feathers. The cover is also hypoallergenic, using 100% cotton with a thread count of 300. So overall, the Pancake Pillow is one of the top recommendations from us for all types of users, including stomach sleepers. It’s easy to use, easy to adjust, and you can get the right thickness suitable for you. Even if you slept on your side or on your back, you can adjust the thickness to what you need. We’re not sure about the “5-star luxury materials” marketing message on the packaging, so we don’t have much to comment about it, but we can tell you that the material is of good quality and durable. Machine washable and tumble dry on low for cleaning. No cheap materials here! The Downlite Down Pillow is the go-to for a super soft stomach sleeper pillow. Admittedly, the first impression we had wasn’t great. We weren’t a huge fan of the edges of the pillow, and it felt way softer than we originally expected. Once we started trying the pillow, it was a different experience (can’t-judge-a-book-by-it’s-cover kind of experience!). The pillow is supportive of our necks, and is wide with enough depth for a nice snuggling experience when sleeping on your belly. Coming back to the whole judge-a-book-by-it’s-cover initial impression, we thought the price was a little high, but for good reason. 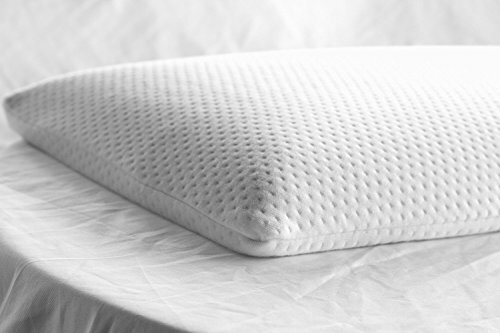 The pillow filling is a great quality white duck down that provide a lot of soft and comfortable cushion. The fill power of the duck down is between 525 to 550, with 14 ounces worth in the pillow. It was easy to fluff, and the filling shifting around was there but wasn’t bad at all. According to Downlite Bedding, their down is washed and sanitized before being put as filling for the pillow. This cleaning process removes the odor and allergens (the duck down does come from the ducks themselves, afterall). When its wrapped in its cotton cover (nonremovable), you end up with a hypoallergenic pillow. The cover is soft and smooth, and doesn’t make any crinkling noises (great because we couldn’t help but scrunch up the pillow to each of our own liking). The case isn’t stuff, and is made of 100% sateen cotton. The thread count is 230. The entire pillow is machine washable and machine dryer friendly, so it makes for easy cleaning and care. We mentioned we weren’t a fan of the edges of the pillow because they were slightly thick and we thought they would bother us in our sleep. Closer inspection tells us we can rest assure the pillow won’t rip and tear along the seams because they are double stitched very well (lower end pillows don’t bother with this type of sewing). The edges are barely felt, and when you add in a pillow cover, you shouldn’t notice them at all. Overall, the Downlite Down Pillow is an amazing soft stomach sleeper pillow, with quality cover and quality filling. 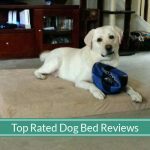 Aside from our initial impressions that turned out to be unjust, the pillow did an excellent job for supporting our heads and felt like a little cloud cushion for a comfortable sleep. We’re also a fan of the light blue striped pattern cover! What we like about the pillow is that its rounded on one side and flat on the other. Naturally, we laid the pillow down with the flat side down and rounded side up when trying it out. However, we really do love that we can flip the pillow and lay our heads on the flat side because it let us slide both our hands underneath the pillow to comfortably hold onto when laying on our stomachs. The flat side is also nice if you want to lay your chest on the pillow when still awake in bed. The pillow is made from memory foam, which is hypoallergenic, anti-microbial, anti-bacterial and bed bug resistant. The cover is cotton with little dimple patterns that gives a soft and comfortable feel that’s different than every other simple flat pillow covers. The dimple patterns do provide more breathability for the pillow to help with regulating the pillow temperature with better airflow. The cover is also removable for machine wash and dry. 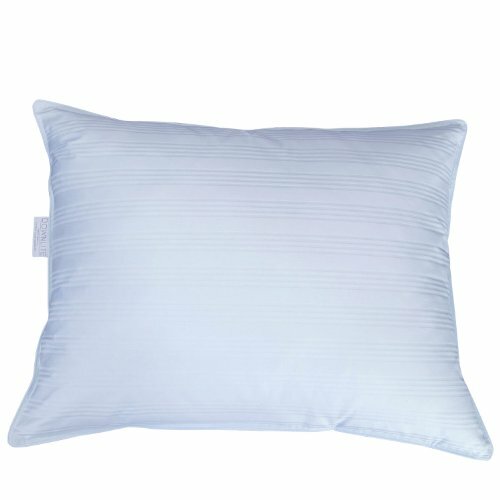 Overall, we love this thin slim sleeper pillow. When we first started researching, we originally felt that 2.5 inches was way too thin. What we didn’t account for was that it was memory foam, and 2.5 inches really wasn’t that bad. We do personally wish the pillow was longer with more depth for more space since we enjoy putting our arms underneath the pillow while laying on our stomachs. Odor was there when we first unpackaged the pillow, but it went away about two weeks later (which is pretty much average for memory foam material). Nevertheless, the Elite Rest Memory Foam Pillow is good choice for those in need of a thin, but firm cushion-y pillow choice. What Makes A Great Pillow for Stomach Sleepers? Thin, but with cushion. The pillow should not be thicker than 1 to 3 inches when compressed. The cushion provides neck and face relief, while the thinness ensures the neck and spine is not placed in a straining angle. The thickness accounts also accounts for the 0.5 to 1 inch compression of the mattress from the head. Breathable and wicks away moisture for cooler sleep. Preferably with cooling features, the pillow should use a cover fabric that has airflow and can help wick (pull away) moisture (like sweat) so you can cool off quicker. We also considered the type of material used for the pillow filling. Memory foam with gel (infused or with beads), foam that is aerated (with holes), or pillows that use down or down alternative filling are all considered during our research. Adjustable in thickness (optional). This is a big plus and a huge factor in our review process. Not all pillows are great for everyone. If the thickness (and comfort) of the pillow can be adjusted, this means more power to the sleeper to change it to suit their needs. It also means a pillow that can be changed to suit all types of sleepers, such as for side sleepers and back sleepers.